Either decide or flip a coin. Update to this story. On Wednesday the NFL released a statement attempting to clarify the commission’s letter about ban players from standing during the national anthem. 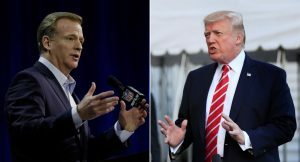 Goodell sent a letter on Tuesday to all 32 league owners regarding the protests that have taken place during the national anthem, according to Schefter.